Lorena Sandoval Herrera is an amazing 4th grade teacher at Dr. Martha Mead Elementary School in San Antonio. Mead is one of the most unique & diverse campuses in Texas. It is a school that has a population of 800+ students, of whom 85% come from economically disadvantaged backgrounds or are considered English language learners. Lorena reached out to me in 2013 asking me for some materials that could support her efforts to familiarize her students with Louisiana Tech. Her goal was to inspire her students to set college as a goal early in their education, knowing that this would be a key to them having a successful life. (more background on Lorena’s story can be found in my previous posts: Bulldog Pride in San Antonio, Bulldog Pride in San Antonio Teacher is Educator of the Year and Bulldog Pride in San Antonio part 2) Lorena is getting ready to kick off her fourth year of teaching students what it is like to be a Bulldog, and she reached out to me with another note. I thought that you would want to see her message to me about of the impacts of her efforts. Clearly, she is inspiring students to be successful, and I am very proud that Louisiana Tech Bulldogs are serving as a model for them to follow. Here is Lorena’s story: “Congratulations on the beginning of a new academic year at Louisiana Tech. I am happy to say that I am continuing the Bulldog tradition here in San Antonio with a new 4th grade class. These new students are as excited as ever to be a part of the Bulldog family. This first week of school they are learning about the tenet of respect, as well as the Bulldog fight song and other traditions that take place in Ruston. My goal this year is to continue to expose my students to the many amazing qualities about Louisiana Tech. I am hoping to have another speaker in my class as I have in the past few years. I remember the first year I had an aviation student visit, and I was very fortunate to have you, your wife, and a recruiter for the university visit my class as well. If you have any contacts who may be able to visit my class this year, please let me know. I was able to share “Born to Be a Bulldog” yesterday with my class, and they loved it! I will continue to update on twitter and through email throughout the year. I thank you deeply for the continued sponsorship and support of my students. I can honestly say that I have seen the impact in my students as they get older. I also wanted to share a nice story about one of them: My first year teaching I had Antoine in my class. He was a child who had been misguided and struggled behaviorally and academically in school due to many outside factors. He was born to a family of refugees who came to America before he was born to escape political turmoil, is economically disadvantaged, and an English language learner. At the time, he had 9 brothers and sisters and one on the way. He struggled to grow throughout the year. However, one motivating factor was college. He loved being a Bulldog and every time he made a mistake or a poor choice he was reminded of how that represented his family, his classroom, and ultimately the Bulldog family. He made me very proud that year as he earned his trip to the basketball game vs. UTSA here in San Antonio, and shared his story to a school board member of how he realized the impact his choices had on his goal of going to college. I have kept up with Antoine throughout the years, visiting him and his family as well as many other students. Now going into 7th grade, Antoine came to Mead last week with his siblings to Meet the Teacher. I apologized to a parent as I stopped our conversation to go say “Hi” to Antoine. The parent then commented, “That boy lives at our apartment complex. He is one of the most respectful young gentleman I have ever met!” Those words brought tears to my eyes! A child who had previously hated school, didn’t know what college was, and had a reputation for being disrespectful in his younger years was now known as a respectful young man. I wanted to share this story with you to show how much the university sponsorship has meant to so many of my students, and how it has positively affected their lives. 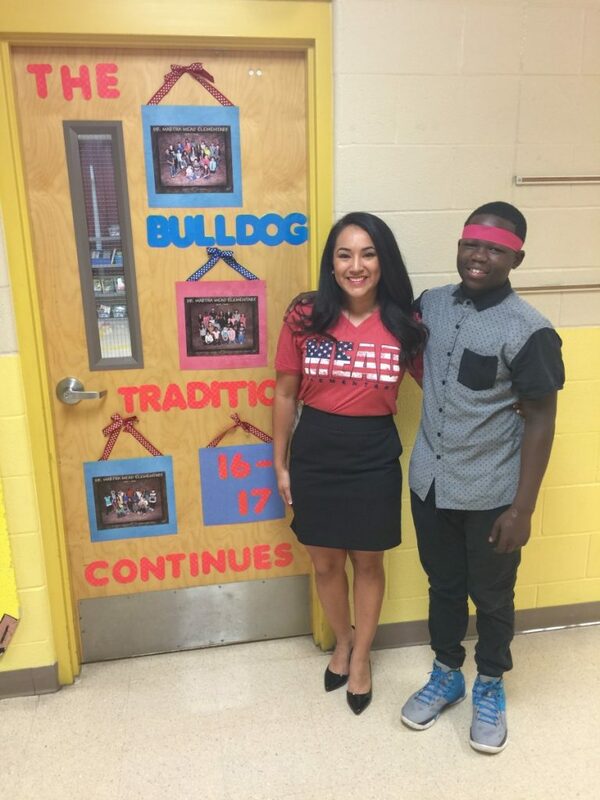 I cannot wait to see the day where my first class of “future Bulldogs” walks the stage on their way to college.” Thank you, Lorena, for making a difference in the lives of these students!